Acheng District, formerly Acheng City, (Manchu Language : Alcuka Hoton) is one of nine districts of Harbin, the capital of Heilongjiang province, People's Republic of China, covering part of the southeastern suburbs. As of 2010[update], it had a population of 596,856 residing in an area of 2,680 square kilometres (1,030 sq mi)[note 1], and is 29 km (18 mi) southeast of downtown Harbin, 190 km (120 mi) north of Jilin City, and around 50 km (31 mi) south of the Songhua River. It lies within the basin of and until 1909 was considered synonymous with the Ashi River which gave its name to the Jurchen Jin Dynasty. The district administers nine subdistricts, eight towns, one township, and one ethnic township. It borders Daowai District to the north, Bin County to the northeast, Shangzhi to the southeast, and Wuchang to the south, Shuangcheng District to the west, and Pingfang and Xiangfang Districts to the northwest. Acheng was known to medieval China as Huining Prefecture, an area of Shangjing. 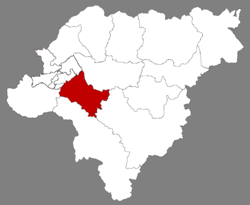 Its eponymous seat served as the first capital of the Jurchen Jin Dynasty (1122–1234) and served as a subsidiary capital from 1173 until their conquest by the Mongolian Empire. There is currently a museum at the site, about 2 km (1.2 mi) south of the Acheng urban area. Acheng County was established in 1909. It was designated a county-level city in 1987 and turned into a district of Harbin on October 9, 2006. The area is rich in mineral resources, including sources of rock, volcanic rock, granite, molybdenum, zinc, lead, iron, and copper. The agricultural strengths of the area are grain production and cattle. Grain production is strong, having produced 33,100 tons of grain in 2002; much of this grain is essential in feeding the important city of Harbin. Acheng is a major industrial area for Heilongjiang, with over 300 types of enterprises, including textile, electromechanics, food, building materials (especially brickworks), metallurgy, breweries fueled by the local grain, sugar refineries, a flax plant, iron, steel, and the production of medicine. In 1996 a new technology industrial development zone was created on the western side of the city to encourage the development of high technology, export-oriented industry. Tourism is also a growing part of the local economy. Acheng is located on the popular tourist route serving Harbin, the Yabuli ski resort, Lake Jingpo, and Xingkai Lake. A number of historic and nature reserves in the area also attract visitors. The city of Acheng is a 50 km (31 mi) drive from Harbin Taiping International Airport. The Harbin–Suifenhe Railway (part of the original Chinese Eastern Railway) passes through the district. There are over twenty commuter rail lines in the rural area. The station is Acheng Railway Station. G10 Suifenhe–Manzhouli Expressway and China National Highway 301 both connect the district to downtown Harbin. Huang Taihua: artist born in Acheng (1947), director of the Academy of Fine Arts of Acheng, director of the Heilongjiang Artists Association. ^ Some sources give an area of 2,452.1 square kilometres (946.8 sq mi). ^ 2010 Census Harbin primary statistics report (《哈尔滨市2010年第六次全国人口普查主要数据公报》). Accessed 8 July 2014. Cohen, Saul B., ed. (1998) . "Acheng". The Columbia Gazetteer of the World. New York, NY: Columbia University Press. ISBN 0-231-11040-5. 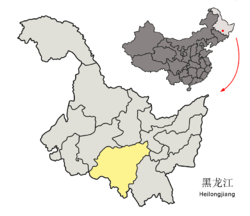 "Acheng, Harbin, Heilongjiang, China, 150300" (Map). Google Maps. 2014. Retrieved 31 Jul 2014. Hoiberg, Dale H., ed. (2010). "A-ch'eng". Encyclopædia Britannica. I: A-Ak - Bayes (15th ed.). Chicago, Illinois: Encyclopædia Britannica, Inc. ISBN 978-1-59339-837-8. Ming, Ben She. Yi (2011). Harbin Statistical Yearbook 2011 (Chinese: 《哈尔滨统计年鉴2011》). China Statistics Press. ISBN 7-5037-6314-0. Anon (2012). 2011年统计用区划代码和城乡划分代码：阿城区 (in Chinese). National Bureau of Statistics of the People's Republic of China. Archived from the original on November 5, 2013. Retrieved 2013-01-25. Wikivoyage has a travel guide for Acheng.